Why would you need DPF Doctor? Has your car lost power? HQ Garage are DPF Diagnostic and Cleaning Specialists covering the Fife area – we are part of the DPF Doctor National network of specialists. Our DPF Cleaning Service covers the Fife area, contact us to see how we can help. Why is a DPF important? – Diesels can produce lots of particulate matter (soot) that can lead to respiratory problems and cardiovascular diseases. Since 2009, modern diesel cars have been required to be fitted with a DPF to stop the spread of the soot into the atmosphere. Warning Lights – Never ignore a warning light showing that the filter is blocked – if you act when you see the light an active regeneration cycle should be undertaken to clear the warning light by driving for 10 minutes or so at speeds over 40mph. Ignoring a DPF warning light can be harmful to your car – driving in a relatively slow, stop/start pattern will cause soot to build up in the filter and your car will go into ‘restricted performance mode’ as a preventative measure designed to protect your engine. By this point: Simply driving at speed will not suffice. A reputable dealer will have to do a manual or ‘forced’ filter regeneration. In extreme cases, the filter may have to be replaced entirely There’s usually a relatively short time between the DPF being partially blocked and it getting so blocked that it needs a manual regeneration. What problems can a DPF cause? 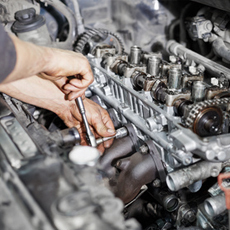 – In order to maintain effective performance, a DPF has to be emptied regularly. Usually this is achieved passively by a process called ‘regeneration’, when the exhaust temperature is high enough, by driving at road speeds higher than can generally be attained on city streets. Active Regeneration – As many of us use our cars for driving around low speed areas in town, many cars don’t get the right sort of use for passive regeneration to work. Manufacturers now build in ‘active’ regeneration, where the engine software can sense the filter getting blocked and compensates by injecting extra fuel into the engine in a bid to raise the exhaust temperature and trigger regeneration. Active regeneration should be initiated around every 300 miles depending on how your car is used and takes 5 to 10 minutes to complete. 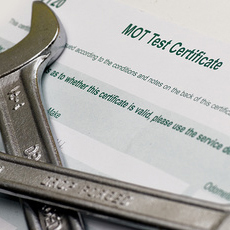 HQ Garage has joined the the DPF Doctor’s network of independent DPF specialists. The team will diagnose your DPF problem as well as any underlying issues that may have contributed to it. We’ll advise you on why this has happened, fix it for you and then give you some practical advice about how best to handle a vehicle equipped with a DPF. What is the DPF Cleaning Process? Stage 1: In Depth DPF Diagnostics – Our diagnostic analysis will check that the key components and sensors are functioning correctly before we begin a DPF clean. If necessary, further investigation is carried out to ensure a successful clean. 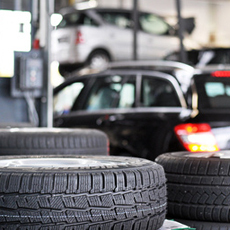 To ensure a speedy, efficient service we carry a wide range of DPF sensors, pipes etc. Stage 2: The DPF Cleaning Process – A carbon cleaning solution is injected into the pre DPF pressure line, initiating the soak period. We run the engine at a fast idle to allow the soak fluid to clean the carbon content from the DPF. Following this, a further injection of a cleaning flush solution is administered during an engine fast idle cycle – we carry out the flushing process twice. 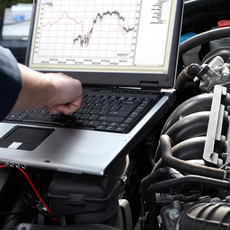 Stage 3: Live Data and DPF Analysis – Finally, we analyse live data during a road test or DPF regeneration. Finally a round of parameter checks will log DPF back pressure readings. The readings from before and after the clean will be reported back to you, ensuring you know exactly what is happening with your vehicle at every stage. This completes the DPF cleaning process. The whole process takes approximately 2 hours to complete.